MINNEAPOLIS, MN--(Marketwire - January 23, 2008) - With the introduction of Fiber One™ creamy nonfat yogurt from the makers of Yoplait, help is on the way for health-conscious consumers struggling to reach their daily fiber goals. As Fiber One hits the dairy aisle, yogurt-lovers now have a new, delicious way to meet their fiber needs. Each 4-ounce cup of Fiber One yogurt contains 5 grams of fiber -- 20 percent of the recommended Daily Value. Available in great tasting flavors including Strawberry, Vanilla, Peach and Key Lime Pie, each cup has only 80 calories, 0 grams of fat and is a good source of calcium and vitamins A and D.
"We are excited to introduce a new way to help consumers increase their daily fiber intake. No other yogurt packs as much of a fiber punch as Fiber One yogurt," said Mike Secor, Fiber One marketing manager at Yoplait. "With the introduction of Fiber One yogurt, consumers can get added nutritional benefits with the great taste and quality they expect from Yoplait." Eating enough fiber is a major component of a healthy diet. Current guidelines recommend 25 grams of fiber per day based on a 2,000 calorie diet. Most Americans struggle to consume even half of the suggested amount, but they can now look to Fiber One yogurt as an excellent source of fiber that they will truly enjoy eating. "Fiber has been proven to play an important role in health including both digestive health and as part of weight management," said Suzanne Skapyak MS, RD of the General Mills Bell Institute of Health and Nutrition. "Food options that contain a significant amount of fiber, such as Fiber One yogurt, and other important nutrients are smart health choices." As people realize fiber's numerous health benefits including helping with weight management, they're seeking easy ways to fit it into their diets. The National Fiber Council reports that 42 percent of Americans consume the most fiber during breakfast, followed closely by dinner (32 percent) and lunch (18 percent). Fiber One yogurt can be incorporated into any meal, or as a healthy snack that can help stave off hunger throughout the day. Look for Fiber One yogurt in the dairy aisle at grocery stores nationwide beginning January 2008. The suggested retail price is $3.29 for a six-pack. 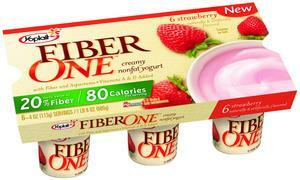 For more information on Fiber One yogurt, visit www.fiberoneyogurt.com. General Mills, with annual net sales of $13.4 billion, is a leading global manufacturer and marketer of consumer foods products. Based in Minneapolis, Minnesota, General Mills' mission is to innovate to make people's lives healthier, easier, and richer around the world. Its global brand portfolio includes Betty Crocker, Pillsbury, Green Giant, Häagen-Dazs, Nature Valley, Old El Paso and more. It also has more than 100 U.S. consumer brands, more than 30 of which generate annual retail sales in excess of $100 million. General Mills also is a leading supplier of baking and other food products to the foodservice and commercial baking industries.